This Fourth of July saw the last great Sioux celebration. Hereafter, according to Chief Stinking Bear, the Indians will have a white man's holiday. It seems a pity, for a more picturesque affair is inconceivable. Picture a houseless, treeless, grass-green plain, guarded by rolling hills and barren buttes, within the shelter of which is a giant circle of tepees, three miles around, the smoke of a thousand camp-fires bluing the wondrous air of a South Dakota summer, the distant prairies dotted with nervous ponies, belly deep in their grazing, while at your feet rages an army of charging, screaming ocher-painted centaurs, bedecked with the barbarous treasures of a whole red nation, each and every one togged out like a cozy corner. Picture not one day of this, but a week, for Mr. Lo is a gregarious party, loving pleasure with all the intensity of his nature, and so impatient that he begins his festival during the last days of June, overrunning as far as the agent allows. When he has celebrated all his ceremonials, given away his choicest treasures, gnawed his dog ribs clean, and danced blisters on his feet, he folds up his tent and steals away, beginning on the morrow to save and plan for the following Fourth. In the earlier times it was customary for the tribe to give to some individual a bag containing a red penny. This was done amid ceremonies on the last day of the festival, and the recipient thereof became obligated to give monthly feasts during the following year, collecting from his fellows moneys and merchandise for the next fete. The ways of the white man are contagious, however, and human nature is weak. How could such a one resist the splendors of neighboring stores? White bank presidents go wrong, a million dollars’ worth at a time. 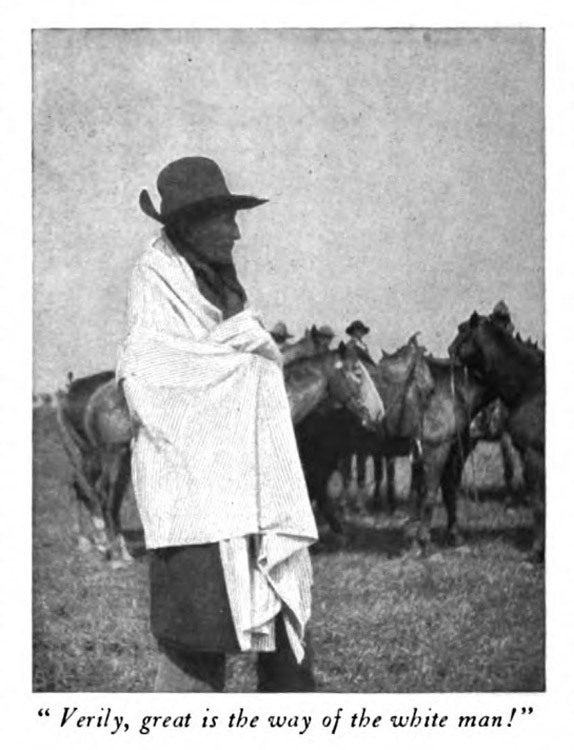 Instead of buying hypothetical bushels of wheat, base rumor has it that Mr. Indian often used his trust funds to buy real calico of pleasing hue and certain alluring liquids which softened the general harshness of affairs. Now, therefore, a number of red pennies are distributed each year, the receivers of which form a committee, whose members check each other. The Government is striving to stop this custom, for it is not unusual that the holders of the symbol go ingloriously broke in providing food and wassail for the rest. Generosity is not confined alone to these few. At each blowout gifts by wholesale are distributed, entire wagonloads of food, yards of cloth, precious bead work, and horses galore being given away, the donors refusing to stop until they have presented all they have of value, and are utterly cleaned. The writer arrived at the field on July 1st, about thirty miles from the railroad, and wishing to mix as thoroughly as possible camped among them. This was made possible by the hospitality of a white trader, who had established a stand on the fringe of the circle, so we rolled down our blankets together, an ice-cream freezer at our feet, a tub of lemonade at our heads, and a case of assorted crackers bringing up the right wing. Amid such hardships one with a strong constitution can last indefinitely. “What is going to happen?” was asked of a mixed blood. “Oh! everything. Rice, and prunes— and—” But he paused there speechless in the glory of such anticipation. Each morning the braves assemble in the hollows without the encampment, and at early daybreak charge forth from the mists, falling upon the camp as was the early custom, while yet sleep drags at the eyelids of the unwary; a yelling, befeathered horde streaming out of the dawn in a thunder of hoofs and a crackle of carbines. It is a wondrous stirring sight to see these stern-faced warriors loom through the grayness and tear past in the glory of full war-paint, whipping eagle feathers, and clinking gear. As they bend and rock and yelp upon their foaming ponies one instinctively crouches low, feels for the rifle-hammer that should be under his thumb, and notes his muscles stiffen and twitch while he mentally shouts to the women and children who ought to be cowering at his elbow. On around the great circle they go, to break up finally for breakfast, as the sun peers inquiringly into the valley. “Come on, boys. Hit ’er up. Only a nickel a ride. Have a ride, have a ride, have a ride. Only a nickel,” and these men, in whom is the fighting blood of the old Sioux war chiefs, and to whom perfect horsemanship is a habit, climbed down from their prancing ponies to mount the tottering, painted wooden horses of the machine. Verily, great is the way of the white man! In the morning it is customary to have sham battles, reproducing scenes of old, and no children ever entered into their sports half so heartily as these unsmiling aborigines. 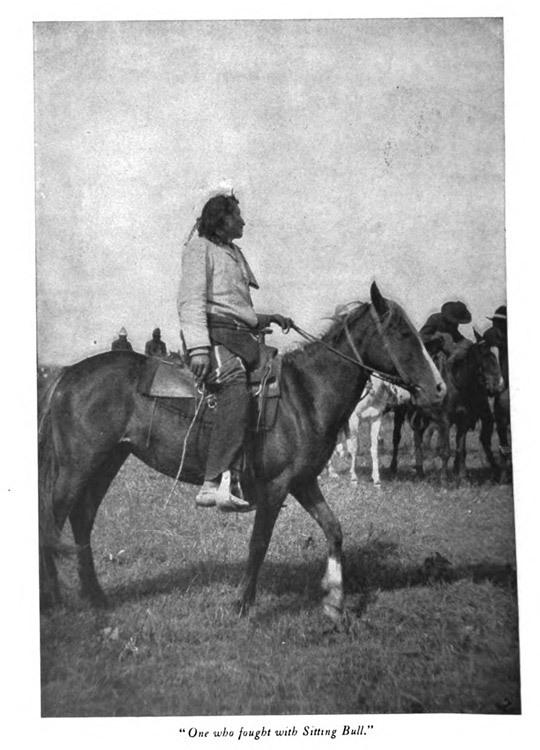 They play the game fairly from the youngest on his barebacked, stiff-legged colt to the wrinkled men who fought with Sitting Bull. When one is wounded he does not dismount and lie down on a soft, dry spot; he reels and pitches from his horse, hitting the ground with whatever part of him is nearest, and in a way to make the most realistic stage fall look like a girl dropping a lace handkerchief. In the center of this mile-wide arena is a smaller circle about one hundred yards in diameter, surrounded by a shelter of boughs. A high medicine-pole, peeled and bare except for the brush on its tip and the packets of “medicine” attached midway, is reared in the center. Here in the shade, the concourse gathers after the races and spectacles of the morning, while sundry dances and ceremonies are performed. The old men group themselves to smoke, passing their three-foot stone pipes from right to left, each holding the quill-decorated stem loosely between his lips, inhaling till the smoke percolates outward through ears, nose, and pores. There is used but one pipe to each group, and with it goes an elaborately worked beaded bag of arm’s length, the sight of which brings water to the mouth of a curio-seeker. For tobacco (“kinniki-nick” they call it), common natural leaf tobacco, is cut up and mixed with the inner bark of willow-trees. The bowls of these huge pipes are very small, and each smoker carries a carved stick to ram down the charge as it burns. When the pipe has gone from lip to lip, and reaches the end of the row, it is passed rapidly back to the first man, who takes a few puffs and deals to the left again. The men seem to be great story-tellers, talking as they smoke, either in a tone of voice which for modulation and music might be copied by a society woman, or by means of a sign language which is quite remarkable. 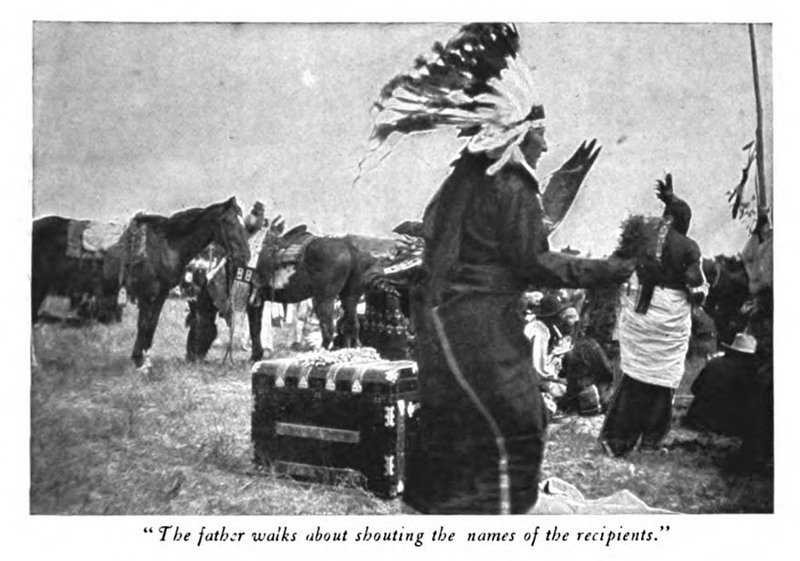 I gathered that this latter is widely understood among the various nations, for I witnessed a Sioux brave talking to a group of Arapahoes and Cheyennes, who had journeyed north from the Indian Territory to witness the fete, while two Winnebago men, who had come from far Wisconsin, nodded understandingly from another part of the circle. These men were separated from each other by fifty yards of chattering, dancing redskins, yet with lightning motions the old Dakotah told his finger story to the strangers. 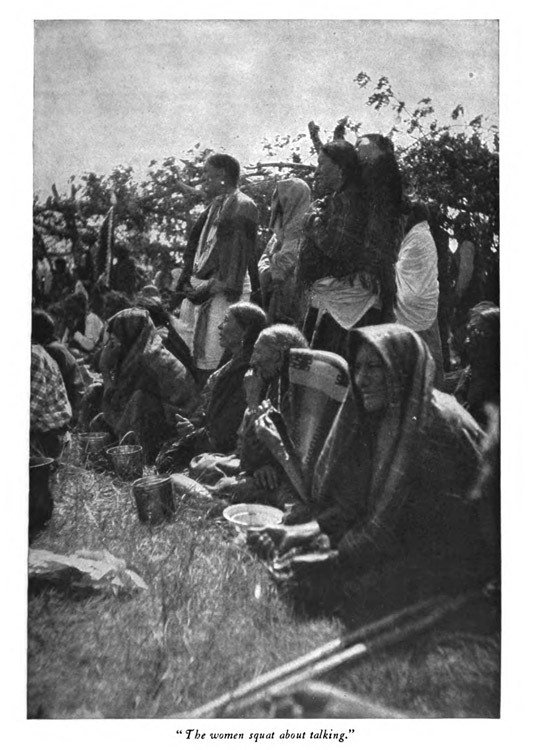 The women squat about, talking or combing their hair, while the papooses on their backs stare with unwinking, uncomplaining silence at the scene; their elder brothers and sisters wriggling about in utter unrestraint. I do not recall hearing a baby cry during my stay with the tribe, and this is the more remarkable from the fact that the elders exercise no authority over them to speak of. Handkerchiefs are unknown, and the untended nose is a concomitant of youth. In the circle about the medicine-pole are held dances, the most common being the “Omaha.” Each dance has its characteristic music, and is accompanied by beating drums and singing of a kind. In fact, such great dancers are these people, that circular lodges are built in each district of the reserve where they gather twice a month for the “Omaha.” That they do not dance and feast themselves to death is due to the agent who allows only this bimonthly celebration. In this dance only the men participate, although there are many wherein the squaws take part. In the old sun dance it was a practise to prepare by fasting and then to slit the flesh of the breast and fasten through the wounds rawhide thongs leading up to the top of the medicine-pole. To show his bravery the dancer whirled and circled about the mast, throwing himself backward in his endeavors to tear out the cords by the weight of his body. Children’s ears were pierced similarly. But all this has been stopped for some years by the Government. Certain esoteric rituals are observed, of whose significance even the younger Indians seem ignorant. Witness the horse dance. 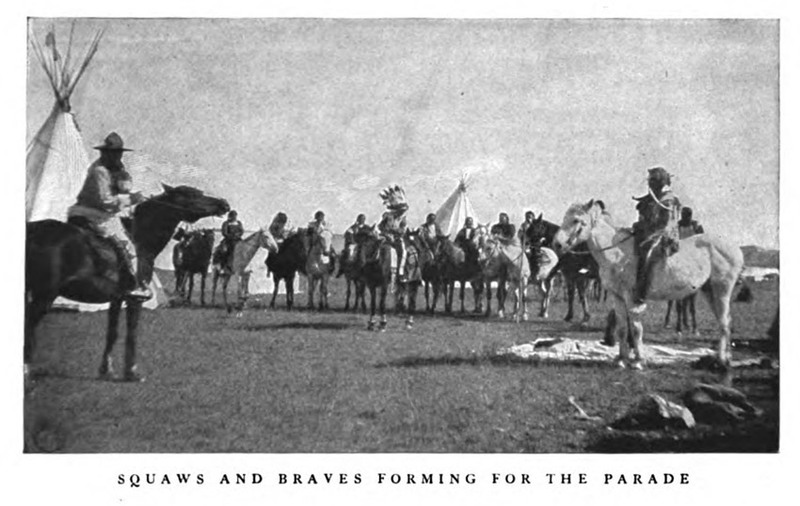 In this, four naked, painted braves led an army of warriors around the three-mile circle of tents, pausing now and then for harangues, at last reaching a solitary tepee where, with arms on high, amid chants, they circled about four times, dismounted and entered, to smoke with a chief who had not appeared at all to those outside. Meanwhile the crowd surrounded the tent, sitting their horses silently, until the old man emerged and made oration, stalking majestically around inside the ring of horsemen. None of the young men could tell me the significance of this, and the old ones would not. Another, more easily interpreted, representing the issue and home-coming of a defeated war party. A bush was planted in the prairie some yards in front of the master of ceremonies, who, by the way, wore a cross upon his breast made from pounded coins, said to be very old. As they rode out each warrior struck the bough with his rifle. In the distance a pantomime battle was fought, other horsemen on racing steeds circling about the party. The only one to return was a footman, cautiously picking his trail, eyes to the ground, low-crouching, and Winchester in hand. Coming to the bush, he paused long, gathering his clues, and then came into camp, where the chief with the silver cross gave him a blanket and filled a pipe. No word was said, the entire audience maintaining breathless silence. Having smoked, the scout could not lie, an Indian told me, and thereupon he recounted his tale of battle and defeat. 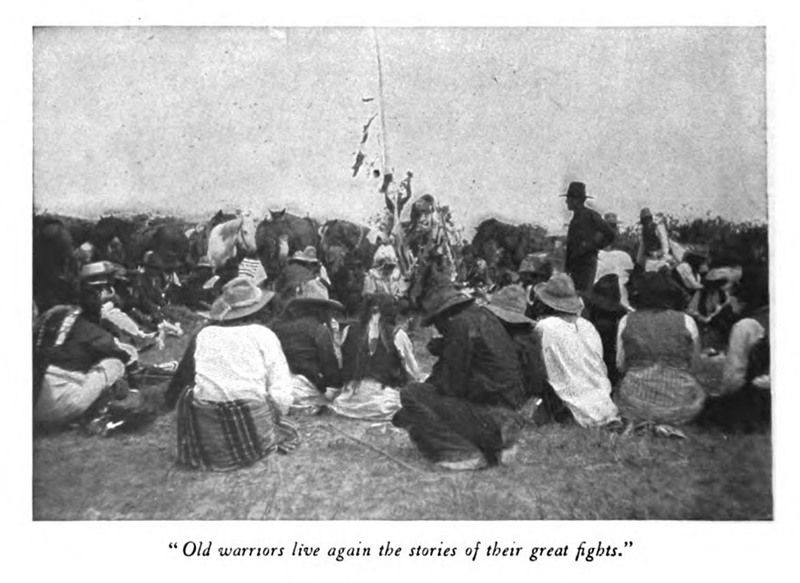 Many old warriors live again the stories of their great fights, half in pantomime, half in song or story, whipping imaginary horses, shooting, charging, and being shot, while about them squats the circle of silent listeners, drinking in the glory that has departed from the Sioux. All these days of preparation are merely limbering up for the Fourth. During the night before, they dance and sing, while the strange Indian smells of a great encampment help, with the weird throbbing of tom-toms and the wailing of squaws from the distant tepees, to form an impression hard to forget. The myriad tents glow from the lights within like a great necklace of fireflies hidden in the mountain grasses. Outside in the darkness the men gather about their drums, each with a stick, the squaws surrounding them shoulder to shoulder. They sing nasally to the beat of the drum, and jiggle in their tracks, the only motion being a slight bending of the knees. All is in perfect rhythm, and done to a strange measure which ends with a sudden yipping chorus. In the lodges the old men smoke and feast and tell stories, while the voids above are lighted by streaming rockets and the air shakes to the roar of giant firecrackers exploding unexpectedly at your heels. This is a warlike people, gathered here in thousands, and yet I did not see a fight in the days that the fete lasted, nor did I hear a voice raised in anger. Quite a commentary on the customs of the civilized and peace-loving whites, where at a city picnic ambulance horses are foundered, and the casualties are those of a storming party. Entering a tent one day to escape a shower, I found an Indian stretched upon his blankets smoking the ubiquitous cigarette. In a corner crouched a slatternly squaw rustling something to eat from two lard cans. Outside the flap was tied a skunk awaiting the time when he should be killed and dished up, making his presence gloriously known, while a youngster, with a very unblown nose, indulged his equestrian strainings by riding a battered trunk. It was a poverty-ridden camp, but the rain fell in sheets, so I apologized for my intrusion. The buck lay on his bed quite indifferent to me, and to the water which streamed over him through the thin drilling above. Another fellow entered and they talked about me in grunts. What wealth of expression a grunt conveys. I prefer to know the worst about myself, and would rather the slanders were in English than to have imagination color them, but efforts to converse were useless, and my pleasantries evoked only an unwinking stare which betokened utter ignorance of the language. Thereupon I tried signs with no better result and gave up. After I had remained half an hour longer, and proved to be not a bad sort, and incurious to a degree, the first man unexpectedly broke his silence. “Why do they call the Fourth of July ‘Independence Day’?” he said in perfect English. My explanation was incoherent, but I mentioned a war with Great Britain. “Oh, yes! I have been there. London is a fine city,” he remarked, reminiscently. Then up spake the other brave from where he squatted with the dripping rain streaking his war-paint. “Archibald was born in Berlin,” said the female sphinx at the lard pails, turning to indicate the child, who grinned at me toothlessly from his barebacked trunk. “Which do you prefer?” they asked. Later it transpired that one was a Carlisle graduate, and all had been abroad with Buffalo Bill. The dawn of the Fourth brings with it the greatest of morning charges, and the wildest joy to all but the canine heart. Tails droop, and howls of melancholy sadden the air, for this is the day of the dog. Flour, lard, sugar, and such speechless delicacies as rice and prunes have been distributed during the past days, and now is prepared the pièce de résistance, the chef-d’œuvre, from the enjoyment of which many will gorge till they split their skins. Fires are built, pots filled, and squaws sally forth club in hand. I saw seven dogs killed for one fire, the method of execution depending upon the weapon handiest. Most were beaten to death, although some were stunned by a blow, then a rope fastened about their necks, at the ends of which squaws pulled, till the poor things were strangled. Two old hags secured a twenty-foot tent-pole, and knocked a pup down, then laid it across his neck, and stood on the ends of the pole, stepping toward the middle, until their weight choked it to death. The carcasses are thrown on the fire, all the hair is burned off in a measure, then hacked up and put into the pots just as they are. It is not uncommon for a dog to get up and walk off the pyre, but he does not get far. This cruelty seems not to arise from any particular brutality in the squaws, only from an indifferent callousness and a primitive way of doing things. Services start early in the bower today, for there are many things to distribute. The big “give-away” tepees which, through the week, have stood in a clean circle, inside of the rim of dingy tents, are taken down by the squaws, lugged out across the plain, and erected around the green shelter, to be filled with presents. 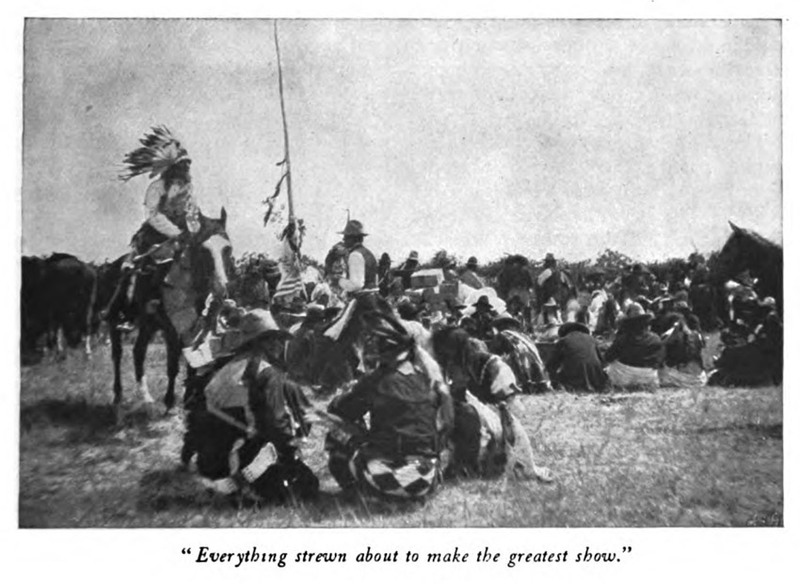 Wagon-loads of grub and merchandise, bales of multicolored cloth, and armfuls of bead work are spread out upon the grass. They are not piled up. Indeed no. The bolts of clean calico are unrolled and spread out in the dirt, and everything strewn about to make the greatest show. Generosity should be advertised. Elaborately caparisoned horses with bank-notes fastened to mane or bridle are tethered to the medicine-pole, and others are turned loose for him to catch who can. Such ones are frightened, till they rush madly about snorting and kicking, then finding their way out on the prairie are pursued by mobs of yelling riders, under a cloud of whirling lariats. One man announced that he had tethered a mare and colt at the agency four miles away, and they would go to him who reached them first. So away went a group of horsemen, vanishing across the prairie like wraiths. 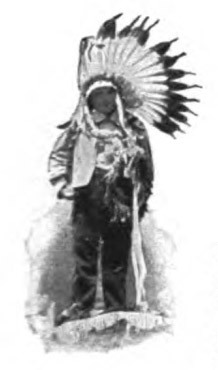 Many parents have their children donate all they own, bringing the youngster into the bower clad in gorgeous war-bonnets and weighed down with beaded buckskin. The little one stands thus in the midst of his heaped-up treasures while the father stalks about shouting the names of the recipients. As a person is called, he rises, walks into the center, takes his present, shakes hands solemnly with the donor, and returns to his place. When the category of friends has been exhausted, a general grab is often called, and the old hags, who have hovered close by, rush in and seize whatever they can. 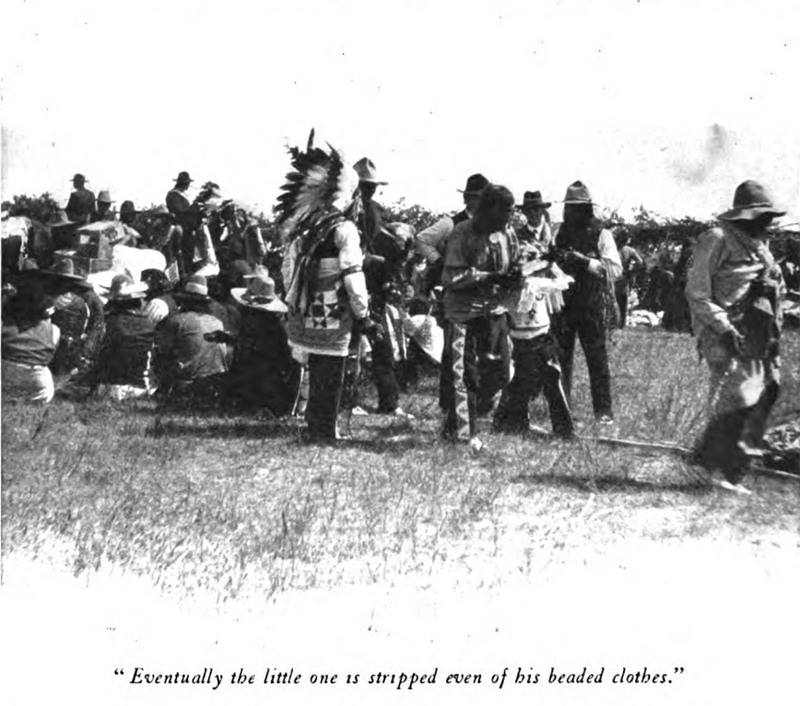 Eventually the little one is stripped even of his beaded clothes, till he stands in pitiful bare legs, then old men come forth and pluck from his war-bonnet the eagle feathers, one by one, till he is robbed entirely of his plumage. Meanwhile the feasting begins. The dogs are done now, and borne out across the prairie by the squaws, while acres of blackened pots appear. It is quite de rigueur to eat with the naked hand, except of the canine soup, which is handled with horn spoons. And now joy is unconfined. Although no reason save a sentimental one exists why the dog of commerce should not be of the diet, yet it exercises an astonishing effect upon the appetite to see a puppy’s head smiling at you from a stew. Midway of the prairie a cow was tied. She was fat, matronly, and possessed of that dignity which bespeaks a gentle mind and simple character. About her a horde of horsemen gathered, late in the afternoon. Here was something I wished to see, so I wormed my way into the press. 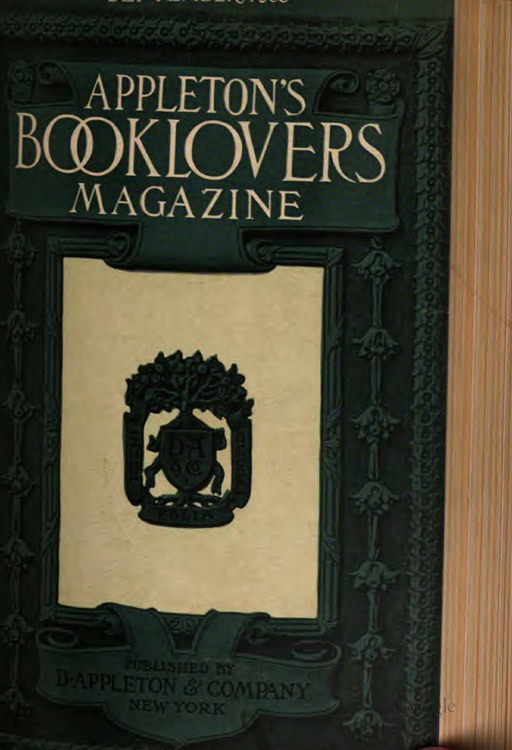 Of all these thousands, every one rides, and a footman is rare enough to cause a commotion. Let him bear a camera, and he is a curiosity. Not only that, but he is in danger of being trampled by the ranks of riders, who stampede hither and yon in solid phalanx, the ponies crowding till they are carried from their feet. Patient surprise was in the dark eyes of the cow, as ropes were passed around her bust—the word does not seem right —and he who would was invited to ride. “Very tame sport,” I thought, as I focused, for she had gone to grazing again. When no one volunteered, I marveled. Evidently these men scorned such cripple’s work, and there was a joke in it somewhere. It was a squaw’s game. At last a man dismounted, shook off hat and coat, and cinched up his belt. I marveled more, for he had been pointed out as the best rider on the reservation, and had busted broncos for Mr. Cody in most of the great cities of the world. I stood near the cow while she munched her grass and flapped a fly from her ear. Then one large and liquid eye winked. Yes, she winked at me understandingly, and I began to wonder if this was the common or garden cow of the East, or if perchance the blood of Texas ran in her veins. The Indian approached and leaped to her back like a cat, winding his fingers into the rope surcingle. Never before had I seen an atavism, to recognize it. That cow became a raging demon. Her eyes narrowed to ominous, steely slits, I am quite sure, her eyes flattened back, and she bared her teeth in a grin of diabolic fury. The peaceful and agricultural lines of motherhood left her frame, while her architecture became that of a dragon in a fit. She swore horribly, in a coarse bass voice, leaped like an antelope, wriggled like a snake, side-stepped like a pugilist, and the champion bronco buster soared through the air aspread, landing between his shoulder-blades with the cough of escaping breath. Eventually the beast was ridden, but a finer bit of cowman-ship I have never seen, nor more wonderful ground and lofty tumbling. With sports of this character come foot and horse-races, more dances and feasting, and finally, when the agent thinks enough celebration has entered into the aboriginal system to last it for a year, the Indians quietly disperse, scattering to their six districts. 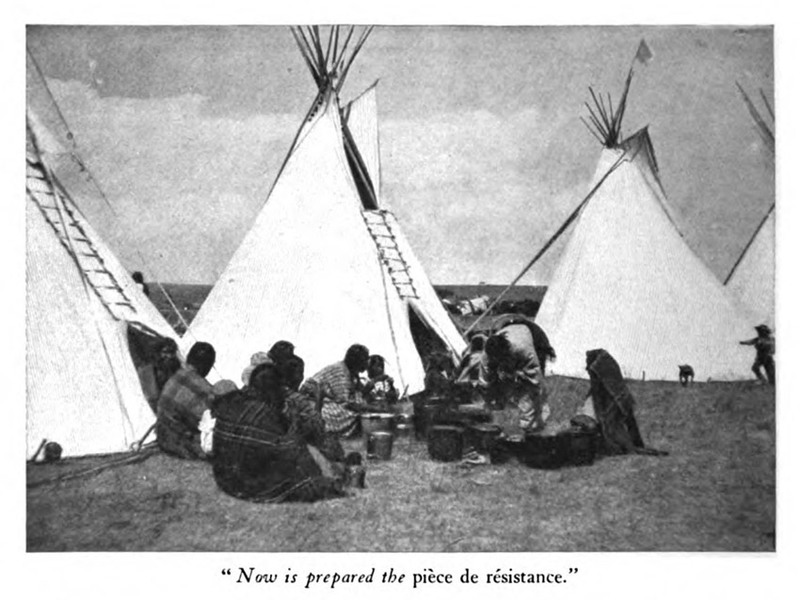 The Sioux will never fight again. The buffalo have gone forever, and so has departed war from the Indian. Under the care of the Government he is growing into citizenship, very slowly, to be sure, but some day he will arrive and be not only self-supporting but self-respecting. The effect of white blood is so strong that the line of demarcation between mixed and full breeds is as cleanly defined as though they were of a different race. The former are the property owners, coming into wealth in certain instances, progressive, and profiting by the ways of the whites, although on festival days they don head-dress and warpaint, reverting to the guise and customs of their red forebears. The latter cling stubbornly to all that was their own, are indolent and itinerant, and the Government has many problems to solve concerning them. Of late, work has been furnished on the roads. Theoretically, this teaches a degree of industry, but for months at a time it takes the Indian away from the homes which we are striving so patiently to make him found. There is no word in his language for “home.” Hundreds of thousands of dollars are spent in his schools where attendance is compulsory, but the system appears to be largely an educational misfit.